We want to greet you in the great Name of Jesus Christ which unites us as a large family. We are all well, thanks to our good Heavenly Father. Our children, who are growing up and are teenagers now, are serving our Lord in the church. It is always very enjoyable for us to sincerely thank you for your valuable support, both financially and spiritually in our work, which is for the Lord’s harvest. It is a great help for us, a family consecrated to our Lord’s service, to be able to continue scattering the seeds in this very beautiful Arica. Thanks to God we have been able to work with a nice group of young children 10-13 years old. We meet with them every Saturday and have different activities. Last July they had a brilliant idea about working to collect money to pay for tickets and accommodations for the Young People’s Congress in Iquique (September 18-20). They organized a flea market and sold many second-hand things. While some of them sold the items, others took the opportunity to give out Gospel leaflets. They also sold hotdogs and so almost all of them were able to attend the Congress. This is a good opportunity to thank God, as He provided us with the means and His protection. Most important of all is what the teens learned about our Lord’s proposals for their own lives. They also had the opportunity to meet other young people from different parts of the country. Since we always keep trying to lead more people to Christ, our Lord gave us the opportunity to have an evangelistic meeting in a place called “Gallinazos” rather far from town at Sister Marita Vallejos’ house. Twenty-three people attended; among them were two married couples, one from Peru and one from Bolivia. It was a very special service and our children helped with the music. Ruth played the piano and Melissa played the violin. It was beautiful. We thank our Lord because the unit we had started on the Bible in our Sunday school, finished with the Day of the Bible on October 6thand with a special service on this valuable Book of eternal richness. The picture above is from that service. Jonathan is also thankful for the opportunity he had to travel in October to Chillán, which is far from Arica. He attended the Presbytery meetings where our work in the Lord’s mission is discussed and agreements are made to support it. Jonathan was also able to spend time with his family, his brothers and his very elderly mother. 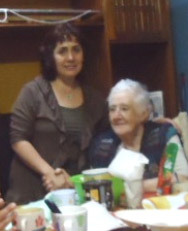 The Sisters of the Women’s Group meet once a month at Eliana Reyes’ house, as she is sick and cannot attend our church. The Women’s Group encouraged her with our Lord’s Word and their prayers. She is 84 and has diabetes. She has a wound on her right leg and is in constant pain, but she is always willing to help others. Finally, we thank God for the worship service held for the 16th Century Reformation Day. We showed a film on Martin Luther on this occasion. “Thanks be unto God for his unspeakable gift.” II Corinthians 9:15 We wish you all a merry Christmas and a time of rejoicing and gratitude for the love you have given us through His beloved Son Jesus. We also wish you a Happy New Year full of blessings.